Julie Krause is an expert psychotherapist/trainer at CVT Ethiopia. Mandalas are meditative and peaceful. 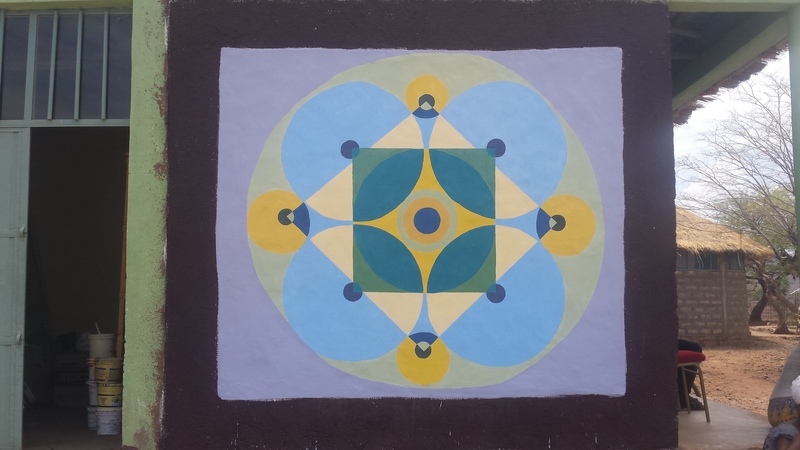 We decided to put up a mandala mural on one of our buildings in the Mai Ayni camp so that people who walk among the group of buildings and tukuls at CVT’s center see and feel the calm that comes from them. Visitors can stand in the space and observe the shapes and colors. With a mandala, the viewer doesn’t feel pressure to analyze or have an answer – it’s just shapes. You don’t need any direct connection with the images. As an art therapist, I appreciate the powerful role that art plays in the healing process. We are now putting up murals in both camps where we see our clients, and the mandalas are being painted by CVT counselors and psychosocial counselors. 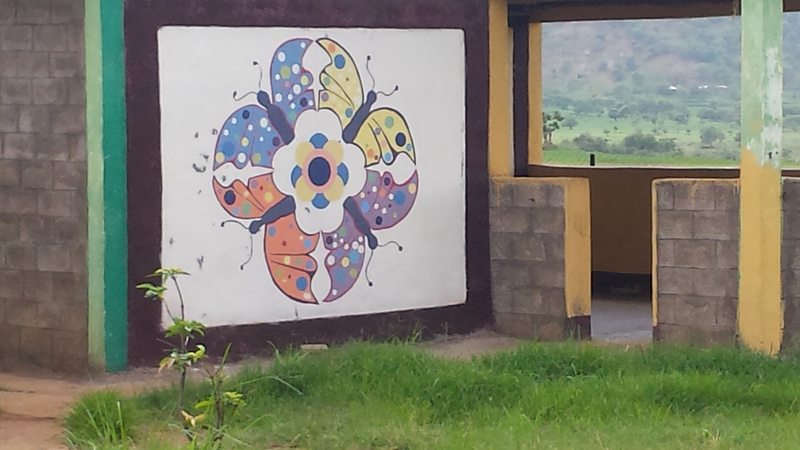 Photo: A completed mandala mural on one of the CVT Ethiopia buildings, Mai Ayni camp. Mandalas have been associated with wholeness and spirituality in many cultures throughout history. However, mandalas are not from the culture here in northern Ethiopia, where we work with Eritrean refugees. So before the first sketch went up, the first thing we did was to educate staff about the meaning and uses of mandalas within other cultures throughout history. Mandalas represent wholeness through the circles that are usually found within the design. These circles are complete shapes with no defining beginning or end. For many people, this completeness evokes a sense of center. The additional design elements and shapes that radiate outward from that core are often thought to be symbolic of the shapes and patterns found in nature and the sciences. Because the shapes are universal, they are often perceived as representing humanity and our relationship with the larger universe. The healing aspect of mandalas has been discussed for decades, with Carl Jung cited as one of the first to introduce mandalas as part of therapeutic interventions back in the early 1900s. I’ve been aware for years of the benefits that come from spending as little as 30 minutes coloring, with effects similar to those resulting from meditation and what it does to the body, lowering heart rates, decreasing stress, and more. While training the counseling team, I found pages with blank mandalas and asked the counselors to color in the sketches, rather than feeling pressure to have to create their own mandalas. People were very interested in it; I’ve had good response to the idea of art direction and process in our work with survivors of torture – all have been positive. It’s a new approach for the team, and we’re always looking for meaningful connections with clients. Photo: A mandala mural at CVT's center in Adi Harush camp. To create the murals for the CVT buildings, I created a color palette and drew the sketches on the wall, next filling in the mandalas with color, with the help of the Mai Ayni team. CVT’s center in the camp is very welcoming, and the murals add to this feeling. This is a space for peace. For curiosity. People from all over the camp have come over to ask what the mandala is. It’s a good feeling to engage visitors in talking about the positive images here at CVT. 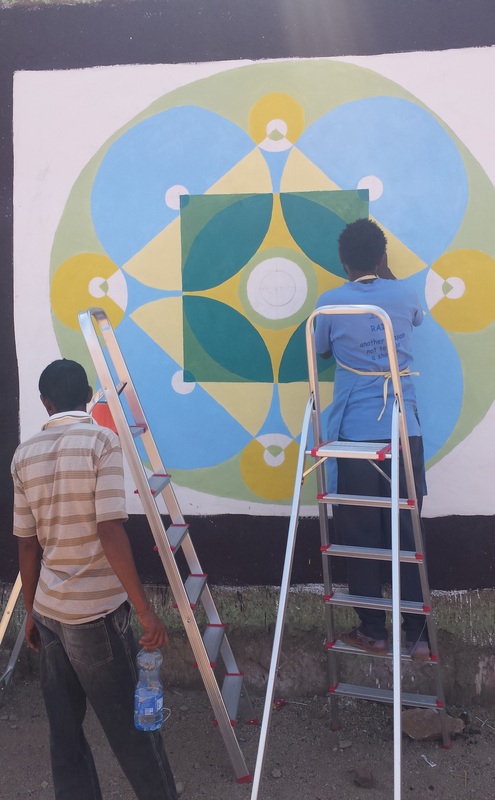 Photo: CVT Ethiopia staff paint one of the murals. I also use art-related exercises like coloring with mandalas in my individual counseling sessions with survivors of torture, as well as when I do clinical supervision with counselors. Coloring is very beneficial for helping clients engage in a meditative activity; it’s grounding and helps bring people back to the present moment. When someone who’s experienced trauma can sit down and color, even if it’s a pre-made mandala, they are practicing good coping skills. Art therapy practices are especially good when working with children, which we do so frequently here at CVT Ethiopia. Children don’t necessarily have the words to express what’s going on internally. Expressive art therapies – dance, music, drawing, poetry and more –these get underneath the surface. The children don’t have to use words to express what they feel. What needs to come out happens when you use visual art, movement, drama or music.